 A PROUD AMERICAN ACHIEVEMENT: For Stevenson Ranch resident, the successful landing of Spirit will help with sister rover Opportunity's descent to the Martian surface. Editor's note: Many of the 650 NASA/JPL team members on the Mars Exploration Rover program live in the Santa Clarita Valley. We will follow them throughout the mission's three-month ground phase as the rovers search for signs of past life on Mars. Stevenson Ranch resident Wayne Lee, chief engineer for entry, descent and landing, reacts to the signal indicating the Spirit rover arrived in Gusev Crater on Jan. 3, 2004. Photo/Associated Press. PASADENA  It was the shortest six minutes of Wayne Lee's life. The Stevenson Ranch resident called out the data from NASA/Jet Propulsion Laboratory's Spirit rover as it plunged through the atmosphere of Mars and bounced down to its rocky surface Saturday night. But it was the longest 10 minutes of his life as he waited in a control room at JPL for a signal from Spirit to indicate that the rover had successfully landed on Mars in Gusev Crater, a Connecticut-sized basin scientists believe once contained a brimming lake. Lee, the entry, descent and landing chief engineer for the Mars Exploration Rover project, said he really didn't know how to explain the edginess and anticipation he was feeling as he waited for a signal from Spirit. "It's like the big game. You want to go out and do your best. 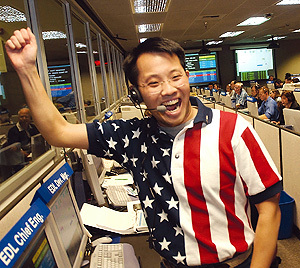 You want to show the world you're the best," said Lee, who was wearing his lucky American flag polo shirt, which he had worn during the Pathfinder landing on Mars on July 4, 1997. Then, a few moments later, JPL began receiving data that Spirit had made an apparently flawless landing in Gusev Crater, beginning a mission to roam the Red Planet in search of evidence that it was once suitable for life. "I remembered back to Cape Canaveral, when I sitting there in May, thinking, is this the last time I'm going to see this thing? Then to see the rover on the surface of Mars  it was so amazing. "What a great day for the United States. The U.S. is second to none in space exploration, and I think the country felt that Saturday. America needs things to feel proud of, and this is one of those things." Over the next three months, Spirit should look for geological evidence of past water activity in the rocks and soil with a suite of instruments. If water once filled Gusev Crater, it may have been a place suitable for life. After the landing, Lee, along with 75 of the engineers who worked on the landing system of the rover project, celebrated their success. "We had the biggest party you could imagine, without the alcohol, of course. We partied until 2 a.m.," he said. Spirit's touchdown was the first successful landing on Mars for any nation since the 1997 Pathfinder mission. NASA failed in its last attempt in 1999 with the Polar Lander, and British scientists said Sunday they would keep trying to contact their probe, the Beagle 2, which was supposed to land Dec. 25. As scientists and engineers marveled Monday at the latest photographs of the Martian surface snapped by the Spirit rover, Lee and others at JPL were busy preparing for the next lander's arrival on the Red Planet in less than three weeks. Lee, along with a team of engineers, analyzed the data from Saturday's landing to see if any changes need to be made to the second golf cart-sized rover, Opportunity, which is set to reach the opposite side of Mars on Jan. 24. "We are analyzing the performance of Spirit to see if there is anything we can do to improve Opportunity's landing," said Lee, who has been analyzing data since 11 a.m. Sunday. "We are looking at how can we make the second one better by learning from the first." ©2004 THE SIGNAL · USED BY PERMISSION · ALL RIGHTS RESERVED.